This is the third article in a series on the MINERνA neutrino experiment. For university students who'd like to work on building an experiment that starts up while they are still students, the close-range, high-intensity MINERvA neutrino experiment is where the action is. "We're doing this quickly," says cospokesperson Jorge Morfin of Fermilab. "Students can be involved in all aspects of the experiment in four years, instead of seeing a 10-year development effort." Most of the 18 collaborating universities are involved in major projects, combined with other groups. Northern Illinois University performs quality control on extruded scintillator bars. Hampton University and the College of William and Mary are assembling scintillator bars into detector planes, with W&M leading the assembly of scintillation counters. "The goal of the task will be to take the 25,000 scintillator bars in the detector and assemble them into robust, light and tight assemblies," says W&M's Jeff Nelson. The University of Rochester is providing fiber optics for light collection and readout; assembly and response tests of detector modules; and reconstruction software. Two universities in Peru, Pontificia Universidad Catolica del Peru and Universidad Nacional de Ingenieria, are also working on reconstruction software. So is the University of California-Irvine, which will also provide the data acquisition system. The University of Pittsburgh is providing front end electronics and calibration systems. The University of Minnesota-Duluth is running the test beam. The photomultiplier tube effort is multifaceted, with the University of Athens, Greece, and James Madison University of Virginia measuring the response of the tubes. Rutgers and Tufts Universities will constructed "dark boxes" to shield the tubes from light and from the magnetic field of the nearby MINOS near detector. Tufts is also involved in calibration systems with Pittsburgh and neutrino generators with Cal-Irvine. 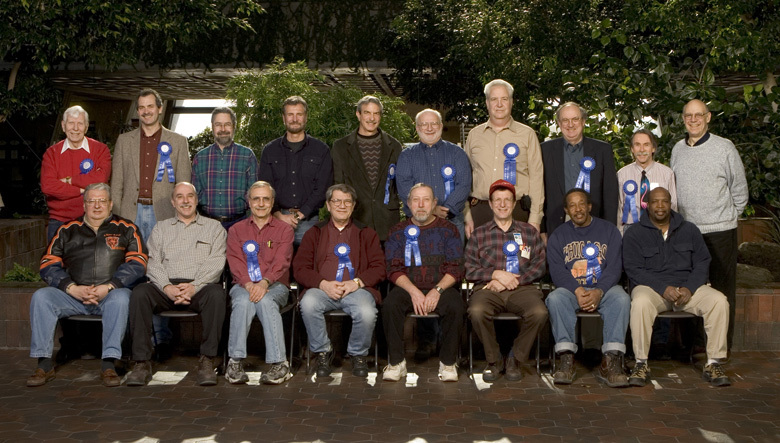 Hugh Gallagher of Tufts and Dave Casper of Cal-Irvine are the primary authors of two widely-used, publicly-available neutrino interaction generators, NEUGEN and NUANCE, and they're developing the next generation of generators with Donna Naples of Pittsburgh. "The organization charts of our project managers, Debbie Harris and Nancy Grossman of Fermilab, show lines that cross time zones and continents," says cospokesperson Kevin McFarland of Rochester. "But the many phone and video meetings can lead to a 'Eureka' moment where a collaborator from Pittsburgh and a Fermilab engineer share a key insight with a group in Boston. Then you realize that those disembodied voices from all over the world make an awfully good team." OSWEGO � Does a ball traveling down a spiral incline go at a constant speed? "I don't know. But I liked the twirly part." That's what one first-grader had to say about the gravity accelerator at a "Hands-On Science" event this month at Prairie Point Elementary School. More than 180 teachers, administrators, parents and students from across the Oswego School District participated in the evening of fun and learning. Families from Prairie Point , The Wheatlands, Homestead, Old Post, Lakewood Creek and Churchill elementary schools took part in the event, sponsored by the PACE parent organization. When Pre-Service Teacher Intern Kristen Maier was measuring grass on the Fermilab prairie last summer, she had no idea her work would land her in wintry St. Louis for a poster session at a distinguished scientific meeting. 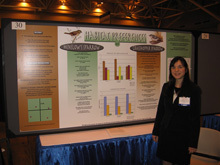 Maier's research, which was conducted at Fermilab and focused on Henslow's Sparrow and Grasshopper Sparrow habitat, was shown in the American Academy for the Advancement of Science (AAAS) student poster session on February 17, along with research done by 13 other Office of Science interns from across the nation. The research was chosen from over 650 projects in the DOE-funded internship program that encourages undergraduates and future science teachers to conduct field work with professional scientists for 10 weeks. "I did a study about sparrows, and made a unit about birds that revolved around my summer research at Fermilab," said Maier. "I had no idea that the research would be presented at the conference until later." With help from lab ecologist Rod Walton and from physicist and bird expert Peter Kasper, Maier identified sparrows on site, measured habitat characteristics where she found them, and conducted statistical analyses in order to determine how to best manage the grassland for these rare birds. "It was a fair bit of work. Kristen chose spots with a random number generated on a map, then when through long grass in the middle of summer to identify these birds and measure the vegetation characteristics," said Kasper. "We had a great time at the poster session," said Spencer Pasero, the Fermilab Education office internship manager who attended the conference. Pasero says that Kristen's work is being reviewed for possible publication in the 2006 Journal of Undergraduate Research this summer. "We are all very proud of her," he said. International Folk Dancing will meet Thursday, March 2, at Kuhn Barn on the Fermilab site. Dancing begins at 7:30 p.m. with teaching and children's dances earlier in the evening and request dancing later on. Newcomers are welcome and you do not need to come with a partner. Info at 630-584-0825 or 630-840-8194 or folkdance@fnal.gov. Imapserver1 Downtime March 2 Imapserver1 will be down for maintenance on Thursday, March 2, from 6A a.m. to 7 a.m. Users on imapserver1 will not be able to access their email either via IMAP or webmail during this outage. During this time, both CPUs in the server will be replaced. It is suspected that the CPUs caused the server to crash earlier this week. The next meeting of English country dancing will be this coming Sunday, March 26, at 2 p.m. in the Kuhn Barn. All dances are taught and walked through, and you do not need to come with a partner. Info at 630-584-0825 or 630-840-8194 or folkdance@fnal.gov.